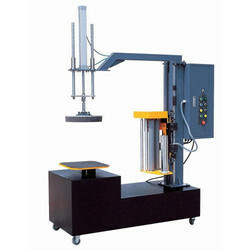 Service Provider of a wide range of services which include stretch box wrapping machines. Stretch Box Wrapping Machines are used to wrap stretch film around a loaded pallet. Film provides extra support while the products are being transported and storage to protect them from tip, spill or from being damaged. Additionally , wrapped loads can be separated and identified. Stretch pallet wrapper is widely used in chemical industry , Electronic industry, building materials, home appliances, paper making, foodstuff and drink etc. Control Omron PLC 0.3 top(bottom)&up-down wrap times choose.Cycle pause capability Time relay ,machine running time can be preset. Film Carriage Drive Film carriage can up-down to suit different height product,heavy duty chain lift,clam and safety. Film carriage not move only suit 300-400mm height product. Looking for Stretch Box Wrapping Machines ?